As we near the end of the Group stages of the NatWest T20 Blast, there is still much to play for in this North Group match. The Birmigham Bears sit atop the table with 18 points from 11 matches. They have already qualified but are keen to gain the home quarter-final tie that a top two place would guarantee. With Finals Day again at Edgbaston, this would give the Bears a clear path of three home matches towards retaining their title. Last year’s defeated finalists, Lancashire Lightning are precariously placed in fourth position. Their last-ball defeat to Notts Outlaws on Wednesday evening means they have won six and lost six. They now have the Outlaws, also on 12 points, breathing down their necks. The Lightning need to win their last two games to be sure of qualifying so Friday night’s clash at Edgbason is a must-win game. The match, as well as being a re-run of last year’s final, also marks the first return to Edgbaston of their ex-player and Director of Cricket, Ashley Giles, now head coach at Lancashire. Brendan McCullum can, of course, win any T20 game single-handed. But for me, the key man for the Bears is Rikki Clarke. He regularly contributes with the bat and, as a bowler who regularly steps up in the power-play overs, he takes wickets and has conceded less than six runs an over. And when the spinners come on and the ball is skied into the outfield, all Bears fans will wish for Clarke’s sure hands to be waiting for the catch. Lancashire will be hoping that James Faulkner‘s imminent drink-driving court appearance is not weighing too heavily on his mind. The Australian all-rounder has only scored one fifty in the T20 Blast but he averages 42 and, as a bowler, he has taken 15 wickets at only 14.33 each and conceded only 6.2 runs per over. Those statistics speak for themselves. The Birmingham Bears will be without Ian Bell, on Test Match duty, but are delighted to welcome Chris Woakes back from injury, to play his first T20 Blast game of the summer. Their most consistent batsman, William Porterfield, is away captaining Ireland and will be missed. Young leg-spinner Josh Poysden, with eight wickets in his six games, seems to have established a place in the side so with Boyd Rankin, Chris Wright and Keith Barker all missing, the emphasis is likely to be on a combination of fast-medium and spin bowling rather than all-out pace. Lancashire Lightning will be without James Anderson and Jos Buttler who are playing for England. 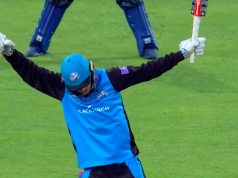 They have seven players who have featured in all 11 T20 Blast games and are unlikely to make too many changes from the team that lost so narrowly on Wednesday. The forecast is for a fine evening, cooling to a slightly chilly 15 degrees before the end of the match. As for the pitch, groundsman Gary Barwell probably has half an eye on preapring and protecting the Ashes Test wicket but will almost certainly produce a true surface for this game.